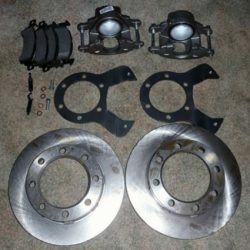 When we first got started, we sold a 14 bolt 6 lug disc brake conversion kit that we didn’t love. 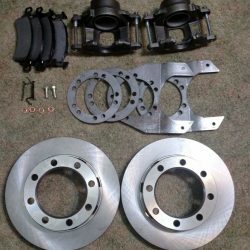 The kit was designed in such a way that the rotor was mounted behind the axle flange. So, to replace the rotors, you had to pull the axle. While the kit worked just fine, we didn’t like that so much work was needed to replace the rotors. We discontinued the kit until we could redesign it, which we did in the spring of 2017. Here’s some info about how our new, redesigned 14 bolt semi-float 6 bolt axle disc brake conversion kit. In order to redesign our kit, we needed to source a 14 bolt, 6 lug axle. As many half-ton GM truck owners know, this particular axle is not very common. It took us quite a while to locate one. Once we found the axle, we looked for a rotor that would slide on, because this would make rotor replacement much easier. We tried a few different options before landing on the rotor you find in our updated kit. *NOTE: The original backing plate still has to removed from the axle to install our kit. This plate can be cut off, or it can be removed by pulling the axle shaft. 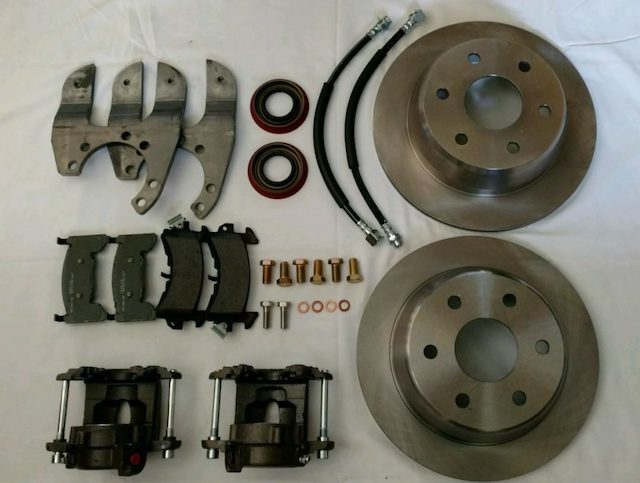 Disc brake conversion kit for 14 bolt semi-float axle with 6 lugs. NOTE: If you would like to purchase only our redesigned brackets for a 14 bolt semi-float 6-lug, you can do so here.